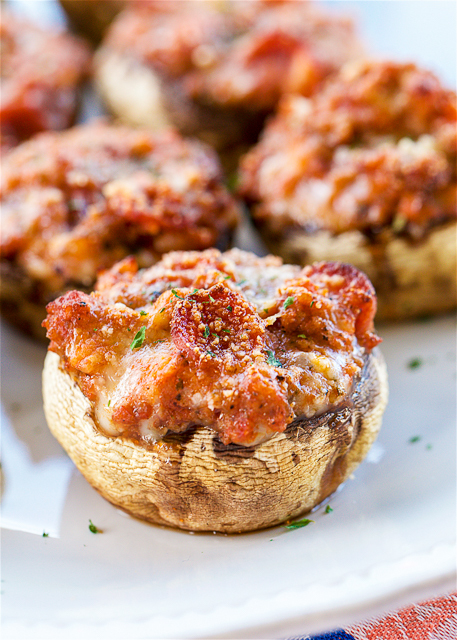 Pizza Stuffed Mushrooms -SO GOOD! Mushroom caps stuffed with sausage, pepperoni, pizza sauce, basil, garlic, mozzarella and parmesan. Feel free to add your favorite toppings. Ready to eat in 15 minutes. Great for parties, tailgating or a low-carb lunch or dinner!! This recipe combines two of our favorite foods - pizza and mushrooms! 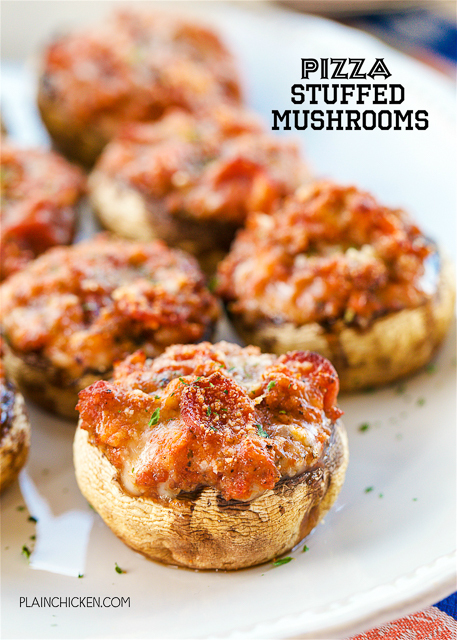 We have made these Pizza Stuffed Mushrooms several times and we can't get enough of them!! They are great for parties, tailgating and a quick low-carb lunch or dinner. We stuffed the mushrooms with a combination of pepperoni and sausage (our favorite pizza topping combination). Feel free to add green peppers, onions, olives - whatever you like on your pizza! The filling for these Pizza Stuffed Mushrooms can be made ahead of time and refrigerated until you are ready to stuff and bake the mushrooms. The amount of mushrooms this recipe will make will depend on how big or small your mushrooms caps are. I got about 18 stuffed mushrooms. I had a few big mushrooms. Wipe mushroom caps off with a damp cloth. Cook sausage in a large skillet, stirring until it crumbles and is no longer pink. Drain. Combine the sausage, pepperoni, pizza sauce, basil, garlic, mozzarella cheese and parmesan cheese in a large bowl. Fill each mushroom cap with sausage mixture. Bake for 15 to 18 minutes, until heated through.